Tennessee / Georgia - Chatooga and Ocoee (see a layout of the Ocoee by clicking here). I used Southeastern Expedition for years while living in Georgia. They are a wonderful company and you can visit them online at www.southeasternexpeditions.com. The Chatooga is a more difficult river and costs more, but totally worth it!!! 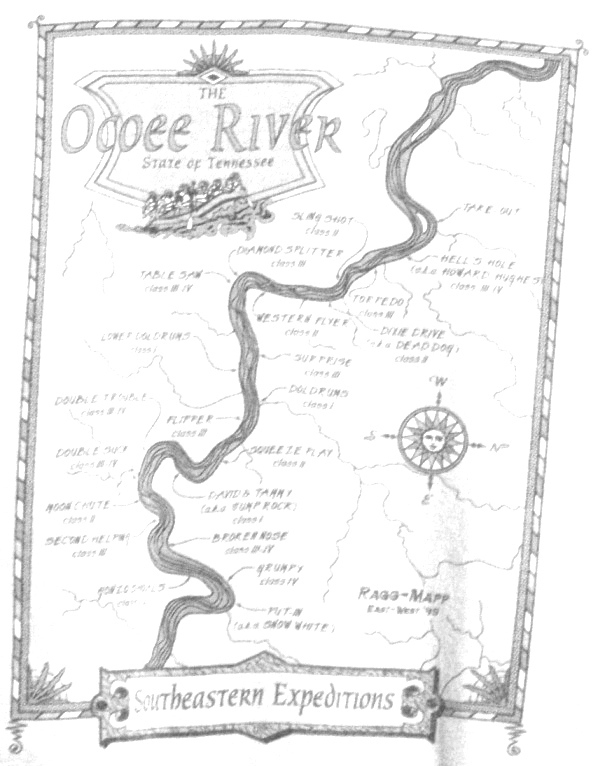 The Ocoee was my 'fall back' river that I rafted when I could not go somewhere else. It is on a dam, so the water flow is always even, you couldn't say that about the Chatooga when the SouthEast was having a drought. Virginia - The James River. I used Richmond Raft Company (www.richmondraft.com) . Fun, relaxing river. Not too challenging, but rafting through a city is a pretty interesting sight. For the Arkansas River through the Royal Gorge I used Clear Creek rafting.(www.clearcreekrafting.com/). Great fun and pretty challenging - they offer overnights. The day started sunny and then it hailed on us and then it turned sunny again, and this was in August- so BE PREPARED! The Clear Creek River is near Idaho Springs, CO. I also used Clear Creek rafting (hey, they were great before, right?). The water was high (June) and very cold (about 37 degrees F). They provided wet suits and splash jackets, but my feet were numb after only a half day of rafting. Nice river, I would compare it to the Ocoee in Georgia. A couple of technical rapids with some fun rapids in between. Just don't fall out because that water is C O L D! In Northern Colorado, I did the Mishawaka full day in late June. I used Mountain Whitewater Descents (www.mountainwhitewaterdescents.com/). However, to really get the full advantage of spring run off - go in early June. It was a fun day. I was in a sleeveless wet suit, which for me was perfect. Oregon - the Rogue River. We went on 1/2 day. Nice beginner river (mainly 1 & 2, only two 4 rapids.). Used Noah's Rafting out of Ashland. Lot's of fun, great guides!